This was posted on Facebook after watching the movie I Am. "We are taught by the great actions that the universe is the property of every individual in it. Every rational creature has all nature for his dowry and estate. It is his, if he will. He many divest himself of it, he may creep into a corner, and abdicate his kingdom, as most men do, but he is entitled to the world by his constitution. In proportion to the energy of his thought and will, he takes up the world unto himself." Here are several quotes from Albert Schweitzer, one of the greatest thinkers of our times. These selections were included in my first digital book "I Am Sharing: Thoughts, Experiences and Learning About Love and Service"
The circumstances of the age do their best to deliver us up to the spirit of the age. The seed of skepticism has germinated. In fact, the modern man has no longer any spiritual self-confidence at all. Behind a self-confident exterior he conceals a great inward lack of confidence. In spite of his great capacity in material matters he is an altogether stunted being, because he makes no use of his capacity for thinking. It will ever remain incomprehensible that our generation, which has shown itself so great by its achievements in discovery and invention, could fall so low spiritually as to give up thinking. current questions about the world and or relation to it in such a way that we could give a meaning and a content to our lives. In modern thinking the same thing happens as in religion. Thinking drops the tiller from its hand in the middle of the storm. It renounces the idea of giving human beings ideals by the help of which they can get on with reality. It leaves them to themselves, and that in a most terrible moment. For the present moment is terrible. Man has won power over the forces of nature and by that has become superman - and at the same time most miserable man! For this power over the forces of nature is not being used beneficially, but destructively. [Religion, p. 1520] from Albert Schweitzer an Anthology. The Beacon Press. 1947. A fundamental impulse to reflect about the universe stirs us during those years in which we begin to think independently. Later on we let it languish, even though feeling clearly that we thereby impoverish ourselves and become less capable of what is good. We are like springs of water which no longer run because they have not been watched and have gradually become choked with rubbish. more than any other age has our own neglected to watch the thousand springs of thought; hence the drought in which we are pining. But if we only go on to remove the rubbish which conceals the water, the sands will be irrigated again, and life will spring up where hitherto there has been only a desert. world-view grounded in thought and essential for life, has led us into a position where we are devoid of any world-view at all, as an inevitable consequence of this, of any real civilization. Technical expressions are a danger for every system of philosophy, whether Indian or European. For they may become formulae which hinder the natural development of thought in the same way as ruts in a road hinder traffic. So to find out what are its real contents it is reasonable to test a system of thought by setting aside expressions which it has coined for its own use and compelling it to speak in ordinary comprehensible language. [Indian, p. ix] from Albert Schweitzer an Anthology. The Beacon Press. 1947. Western thought is not governed by mystical thought by the idea that the one thing needful is the spiritual union of man with infinite Being, and therefore (if it is obliged to renounce the hope of attaining to a knowledge of the universe that corresponds to ethical world- and life affirmation), it is in danger of saying it is satisfied not only with lowered ideals, but also with an inferior conception of world-view. That is the tragedy that is being enacted before our eyes. [Indian, pp. 253 f.] from Albert Schweitzer an Anthology. The Beacon Press. 1947. Renunciation of thinking is a declaration of spiritual bankruptcy. Where there is no longer a conviction that man can get to know the truth by their own thinking, skepticism begins. Those who work to make our age skeptical in this way, do so in the expectation that, as a result of renouncing all hope of self-discovered truth, men will end by accepting as truth what is forced upon them with authority and by propaganda. Humanity has always needed ethical ideals to enable it to find the right path, that man may make the right use of the power he possesses. Today his power is increased a thousandfold. A thousandfold greater is now the need for man to possess ethical ideas to point the way. Yet at the very moment when this happens, thinking fails. In this period of deepest need thinking is not giving to humanity the ideals it needs so that it may not be overwhelmed. Is that our destiny? I hope not. I believe not. I think that in our age we are all carrying within us a new form of thought which will give us ethical ideals. creating a life-long Practice and fellowship of personal and group support. Here is Newday's curriculum for your Multi-dimensional healing/wellness experience in Kochi, India. 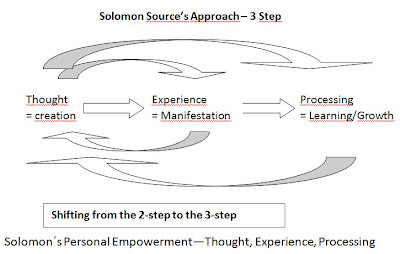 The following outline sets up a "course", or preparation for both individuals and groups who are participating in the Newday Wellness experience, or for that matter, any new venture into personal growth and transformation. The following are suggestions for individuals to read, contemplate and potentially use as guideposts for discovering YOUR-SELF, which ultimately is what we are all here to discover (quote from Ralph Waldo Emerson). This resource is closely associated with the Reverence for Life University which was officially launched in Jamaica in 1994, and has since been evolving into the "University of You!" At the bottom of this post you will find several Websites that are available for individual, community and organization re-creation. Our Vision is to create harmonious playing/working relationships to fulfill the members of the group’s personal aspirations and visions; to support the whole being, spiritual, physical, mental. To create an environment which maintains integrity of the group while assuring that no member “falls through the cracks”. Where, potentially, a long-term support and encouragement group is formed to allow each of the members to thrive and realize their personal potentials to the fullest. To create a fun and full-filling experience that will inspire each person to go realize the potential of NOW and to go forward with their lives with enthusiasm, joy and abundance. Eye Am Breathing this Reality into Being, NOW. Mantra: "MY BREATH IS MY PARADISE OF ORIGINAL SWEETNESS" - it is recommended that this be repeated as often as possible, either verbally, or in thought. Our now moments reach into our future and past. We can transform our past by changing a belief now. As we embrace each now, our future is altered. All of your physical, mental and spiritual abilities are focused together, then in the brilliant concentration of "present" experience. You are not at the mercy of the past, or of previous convictions, unless you believe that you are. 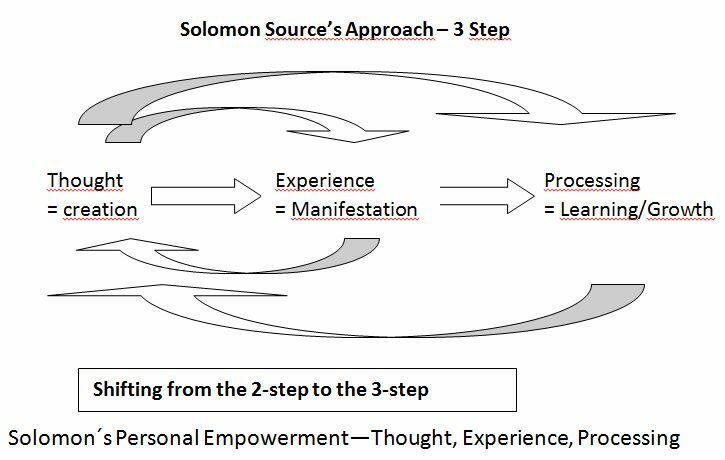 If you fully comprehend your power in the present, you will realize that action at that point also alters the past, its beliefs and your reactions. In other words I am telling you that your present beliefs, in a manner of speaking, are like the directions given to the entire personality, simultaneously organizing and reorganizing past experience according to your current concepts of reality. The future--the probable future--is being altered in the same way, or course. To look backward for the source of current problems can lead you into the habit of seeking only negative episodes from your past, and prevent you from experiencing it as a source of pleasure, accomplishment, or success (very intently). You are structuring your earlier life through the dissatisfaction of the present, and therefore reinforcing your problems. It is as if you were reading a history book that was devoted only to the failures, cruelties and errors of the race, ignoring all of its accomplishments. Such practices can lead you to use your own "history" so that it gives a very distorted picture of who and what you are--a picture that then paints your present circumstances. Those given to such practices--constant examination of the past in order to discover what is wrong in the present--too often miss the point. Instead, they constantly reinforce the negative experience from which they are trying to escape. Their initial problems were caused precisely as a result of the same kind of thinking. A great many unsatisfactory conditions result because individuals become frightened at various periods in their lives, doubt themselves, and begin to concentrate of "negative" aspects. The question. "What is wrong with me?" will only lead you to create further limitations, and to reinforce those that you do have, through exaggerating such activities in the present and projecting them into the future. Which you? Which world? These questions are to be answered in the "now" as you understand it, through the realization that your power of action is in the present and not in the past. Your only effective point of changing any aspect of your world lies in that miraculous instant connection of spirit and self through neurological impact. To rid yourself of annoying restrictions then, my dear friend, you repattern your past from the present. Whatever your circumstances, you use the past as a rich source looking through it for your successes, restructuring it. When you search it looking for what is wrong, then you become blind to what was right, in those terms, so that the past only mirrors the shortcomings that now face you. Angels in Experience, by Dawn Vaz-Green - available from Lulu for purchase. 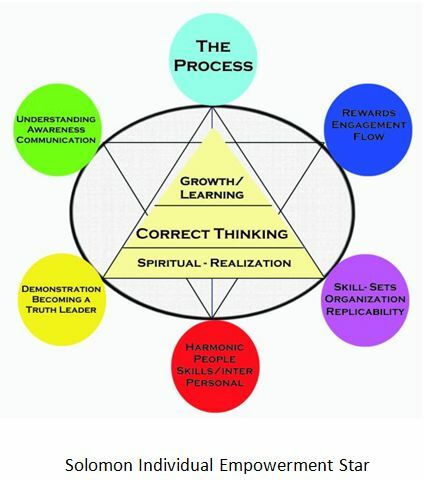 The Practice will provide the foundational principles/guidelines for both the individual and the group experience. The reason is to keep the group dynamics based on solid footing while keeping the process of group communications and interactions as simple as possible. Of course, each group is free to develop their own processes based on their own ideas or referencing other materials and experience. Our emphasis on The Practice is simply to provide guidelines that will keep the group playing and working together for the common goals of the individuals and the group. Special attention should be given to the principles of “Trust”, “Spirit of Generosity” and “Breath Based vs Imaged Based Relationships”. 1. Preparations - for trip, familiarization with Newday program and India experience. 3. Specific preparations for travel. 4. Completing the preliminary reading and reflection and writing. 5. Preparing, adjusting, contributing to be part of the team experience. 6. Study Newday process and expectations/requirements. 7. Prepare personal Study guide, plan and statement as extensive as desired. Newday (RFL) will Share a specific set of activities to continue the health and wellness benefits of the experiences. This item is about developing a personal plan/strategy for continuing the experiences after we return from India. This item may or may not include activities with your team/tribe. ~ Vision Strategy - Life, Bigger Picture (s) - what do you want to create? Who are you? What is your grandest dream? What would like to create as a legacy? - this is each persons personal property. There will be no requirement to share this with anyone, unless the participant desires to share with others. There may be some benefits to Sharing, but truly there will be no expectations to do so. - inspired by the movie "The Bucket List", this would be an initial set of life experiences that each participant is interested in experiencing. There will be a lot of latitude for how this is expressed. ~ what do you want to add? Recommended Reading – outside, some of these books are included as digital books available for download and on the memory stick provided with this experience. When Love Guides Your Thoughts pdf edited by Andrew N. Skadberg, Ph.D.
~ What do I hope to get out of the experience? ~ What do I need to heal, physical/mental/spiritual/emotional? ~ What am I willing to do to change? ~ How am I willing to adapt to work effectively with my team/tribe? ~ The experience starts now (see Recreation Experience Model) and goes until . . . . ? ~ I Am my own living art project/sculpture/symphony! Who, what, do I want to BE and do? ~ What fears or concerns do I have? ~ How committed am I to this process? ~ How open am I to new ideas? ~ Am I willing to change? ~ What Vision do I have for my life from this point forward? Dreams. Aspirations. Prepatory Essays to Read: written and/or compiled by Andrew Skadberg, Ph.D. If you enjoy the above essays, you may want to read a few more that you can access from these links. Is There a Lack of Energy - an examination of the idea of "scarcity", which is predominant in our economic system. The Recreation Experience Model would provide considerable assistance to people serving other people in practically any context. I see this to be a valuable way for businesses and service organizations to look at how they will interact with their customers. Also, to give us a greater understanding about the larger context that we live our lives through our experiences. 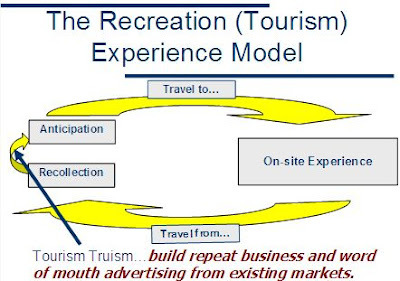 An important concept to grasp for understanding how the tourism product is received by the consumer is illustrated in the recreation experience model. Tourism experiences are unique because, when best developed, they usually occur over time, and will potentially be long-lasting and life changing. Nearly everyone can remember a very memorable travel experience. 1) Anticipation. This first point is when a person begins to contemplate their travel experience. The tourism product provider can make their first impression here because this is when their customer makes contact to make their travel (or visit) arrangements. They might do it by phone, on the Internet (most common now) or occasionally make a preliminary visit. Careful consideration should be given to quality customer service by the business or community trying to attract a customer, often this is when the sale is made. Typically travel purchases are made “site unseen”, unless you have developed a wonderful Website that gives them a sense of the experience. 2) Travel to. As people travel to their destinations they have an abundance of time and they will begin contemplating their future experience. If they have received some promotional information from the attraction they will be visiting, this will enhance their anticipation. 3) On-site experience. This is when the traveler actually arrives and participates in their recreational/leisure activity. As with any business, careful consideration to all aspects of their visitor’s experience is important to make a positive and lasting impression. 4) Travel from. Because travel often takes a considerable amount of time, this can be a very important stage for a traveler’s experience. Based on the culmination of their anticipation, whether or not their expectations were met or exceeded during their “on-site” experience will determine the type of reflection that will occur during this part of the recreation/tourism experience. It is important to note that word-of-mouth is a primary marketing driver for the experiential tourism industry. If the experience was good, then they will likely be thinking of telling their friends and family about their trip. Otherwise, well, we have all heard the saying about at least ten people hearing about it. 5) Recollection. Often times some of the “negatives” of a person’s travel experience might fade over time, depending on the severity of the situation. As mentioned previously, it seems almost universal that people will reflect on their travel experiences and decide whether or not they would like to participate in it again. Their memories can be enhanced by the purchase of memorabilia or by the tourism destination providing some sort of ongoing communication with their customers. This might come in the form of a newsletter, (printed or electronic), or an occasional postcard to inform the client of a special event or offer. In any case, as a tourism product provider, one needs to be mindful of the process of the “Recreation Experience Model” and give careful consideration to the product development and marketing strategies.